From walls to washes to uplighters, the MIRO CUBEâ„¢ 4C color mixing wash light offers a designer maximum creativity in a tiny package. Using best in class RGBW quad color, multi channel chips, a gorgeous palette of saturated, mid-tone and pale tint colors can be dialed in at the touch of a button. And of course, a true white is always available as well, not the unflattering mixed amber compromise found in other lights. Smart programming in the MIRO CUBEâ„¢ 4C includes a stand-alone color wash mode or allows multiple units to be easily slaved together, synchronized and offset using self-generated DMX for color chases and other dynamic lighting patterns without a console. Use it alone, configured in strips & arrays or built-in for virtually any application needing colored light - from stage, studios and location, bars and casinos, to stores, windows and lobbies. RGB+W color mixing balances a dramatic saturated palette with the nuances of a subtle range of tints and accent colors. 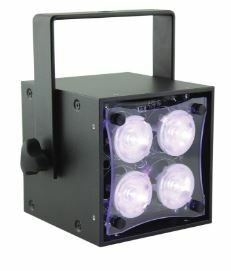 With its RGB+W emitters, mixing the right color is simple for the MIRO CUBE 4C. But the quality of that light is what sets it above the crowd. Powered by the newest generation of 4 channel chips from Osram, the fully blended color mix offers the superior rendering and a single cohesive colored shadow. Combined with a complete with a set of lenses in 20Â°, 40Â° and 60Â° beam spreads, the MIRO CUBE 4C gives a lighting designer all the control they demand from modern luminaires. Quick attach barn doors are available as an additional option. Very little space is wasted in the elegant rugged design of the MIRO CUBE. Our unique patent-pending heat management system allows 50 watts of LEDs to be packed into a tiny 4 inch cube, half the space needed by the most popular comparable lights on the market. The MIRO CUBE has been engineered to be durable, reliable and affordable without sacrificing the qualities expected by demanding lighting professionals. With heat sinks, power supplies and electronics assemblies common to all three models, the MIRO CUBE luminaires have been designed to be future proof, allowing our engineers to quickly respond to improvements in LED technologies without significant alterations to the base unit. Completely connectorized internally, new LED boards can be installed in minutes - for repairs or upgrades or even converting a 4C to a WNC on the fly. Ready for the most demanding professional environments, the MIRO CUBE is powered by a positive locking Neutrik connector and has 5-pin XLR connectors for DMX input and output. Two universes of high speed DMX512 in 8 or 16 bit resolution allow for completely flicker free dimming from your console. An optional "Filament Mode" can be set to mimic the fade of an incandescent lamp going to black. For use without DMX, an intuitive full text LCD control panel dials in brightness and color temperature. Small enough to be built into scenery or soffits, and light enough to mount as a track light. A novel yoke design allows CUBES to be easily hung with c-clamps, configured in linear strips or stacked arrays, mounted on c-stands, fit with floor trunions, converted to canopy mount and retrofit with track hanging adapters - or virtually anything an installer requires.